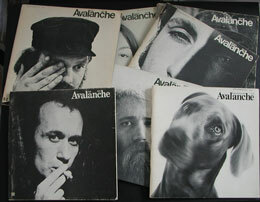 CHELSEA space is delighted to present Avalanche 1970-1976 curated by Lisa Le Feuvre. Art magazines play a crucial part in the distribution of art: they are where we find out about it, see it represented, find opinions, are informed about what we can see and what we have missed and, most importantly, develop a sense of the contemporary moment. Arguably the art magazine effectively produces artwork by rendering it visible to individuals who circulate the artwork further through conversation, texts, exhibitions and citations. The short-lived New York based art magazine Avalanche, which existed between 1970 and 1976, not only captured a sense of its time, but also engaged critically with the relationship between printed matter and artwork. Founded by Liza Bear and Willoughby Sharp Avalanche set out to foreground artistic ideas, with interviews with artists and artists' projects the mainstays of the magazine. 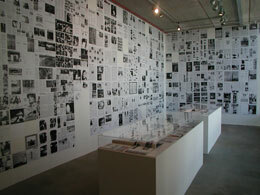 Bear and Sharp aimed to cut directly to the creative quick, assembling a serious publication with an artist-led voice. 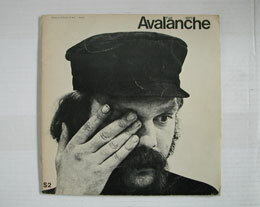 Avalanche featured a community of artists that included Carl Andre, Bas Jan Ader, Alice Aycock, Bill Beckley, General Idea, Hans Haacke, Bruce Nauman, Dennis Oppenheim, Yvonne Rainer, Keith Sonnier, Robert Smithson, Lawrence Weiner and William Wegman. The exhibition at CHELSEA space presents a consideration of Avalanche three decades after its initiation. Although much referenced in bibliographies, the magazine is rarely seen. This exhibition highlights the importance of this incomparable document of artistic production from a time of creative and political activism. In the spirit of the research centred approach of CHELSEA space, Avalanche 1970-1976 proposes a way of thinking around Avalanche with the critical distance of the intervening years, thinking about the magazine as not only an historical document, but also as a contemporary precedent. Alongside walls filled with chronological pages of Avalanche, a series of frames show the 13 covers and vitrines display the contents of the rare magazine themselves. This will be contextualised with artists' ephemera and other magazines from the period of Avalanche, alongside three interviews by Willoughby Sharp from the Videoview series with Vito Acconci, Chris Burden and Joseph Beuys - all of whom featured in Avalanche itself. Each week the vitrine displays will change, highlighting different pages and artists' ideas. 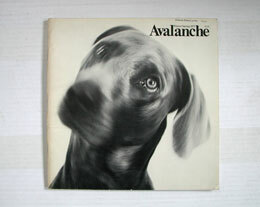 Avalanche appeared in black and white throughout its life-span emphasising the magazine's status as a "document" rather than an interpretative publication on art and artists: this black and white format, creating a document of a document in this very first exhibition in London of Avalanche that has not been seen in a gallery presentation since the early 1970s. The exhibition Avalanche 1970-1976 is accompanied by a pamphlet, published by CHELSEA space in an edition of 500, featuring The Early History of Avalanche: 1968-1972 by Liza Bear and Willoughby Sharp. This will be the first time this essay has been available in English. On June 25 2005 a day conference explores ideas around Avalanche. The key-note speaker is Liza Bear, who will discuss Avalanche: The Making of an Avant-Garde Magazine; The Artist's Voice; Dialogue; Collaboration and Truth to Power. Liza Bear, co-founder of Avalanche, is now a writer, filmmaker and contributing editor to Bomb Magazine. Bear is joined by Clive Phillpot, an expert in the field of artists' books, who will contextualise Avalanche within the wider production of artists' magazines. Phillpot set up the Special Collections Library at Chelsea School of Art, developed the artists' book collection at the Museum of Modern Art, New York, and is the author of a number of books including the Art Press: Two Centuries of Art Magazines, Artist/Author Contemporary Artists' Books. Lisa Le Feuvre, curator of Avalanche 1970-1976, will discuss the relevance of Avalanche today, and the day will be chaired by Jo Melvin, Doctoral researcher in Peter Townsend's Studio International Magazine Archive. Liza Bear is a writer, filmmaker and a contributing editor at Bomb Magazine. She studied philosophy at The University of London. Her experimental films and videos, including Oued Nefifik: A Foreign Movie (1982) and Force of Circumstance (1991) have been shown at the Sao Paolo Biennale, Edinburgh Film Festival, Anthology Film Archives and the Museum of Modern Art, New York. Her short stories have been published in Between C and D, and Bomb magazine. In 1994, she received an Edward Albee Writing Fellowship. For the past decade, her interviews and profiles of world filmmakers have appeared in Newsday, The New York Times, Ms. Magazine, The Village Voice, the NY Daily News, indiewire and Salon.com. She has taught at Columbia University, NYU and the School of Visual Arts. In Autumn 2005 her photographs and videos will be shown as part of an Artists Against the War exhibit in Rome, Italy. Willoughby Sharp is a curator, writer and video artist. He obtained an MA in Art History at Columbia University. Since the mid-60s he has had a wide-ranging career promoting avant-garde art. Highlights include co-producing a television program on Pop ArtUSA for WDR, Germany, and organising shows for the University Art Museum, Berkeley, California and the White Museum, Cornell University, Ithaca, New York. In the 1970s he became a video performance artist, obtaining a Rockefeller Institute Fellowship, and showing in the Venice Biennale (1975); he also produced a series of video interviews with Vito Acconci, Joseph Beuys, and Chris Burden. His 16mm documentary film Place and Process was shown at the Information show at the Museum of Modern Art. In the 1980s, he opened an art gallery on Spring Street, New York. He has taught at Parsons School of Design, the School of Visual Arts and was director of the Fine Arts Centre at the University of Rhode Island, Kingston, RI. Sharp will be giving a European lecture tour in Autumn 2005. After Avalanche ceased publication, Sharp and Bear collaborated again on a number of telecommunications projects: Warc Report: Allocating the Airwaves (1979), a live slow-scan-cable transmission, and Phase II: Send/Receive Satellite Network (1977), with Keith Sonnier. They still live in New York City. Lisa Le Feuvre is a curator, lecturer, and writer based in London. Her recent curatorial projects include Gordon Matta-Clark: The Space Between (Centre for Contemporary Arts, Glasgow and Architectural Association, 2003); Mediterranean: Between Reality and Utopia, Hashem El Madani and Pierre Bourdieu: In Algeria (all 2004, The Photographers' Gallery). Lisa's recent writing projects include essays for the 2005 Scottish Venice Pavilion catalogue, and publications on the artists Anthony McCall, Miles Thurlow, and Esther Shalev-Gerz. She is Lecturer on the MA Creative Curating course at Goldsmiths College, University of London and on the BA Arts Management at South Bank University. With Edgar Schmitz she collaborates on 'public conversations' around contemporary artistic practice realised in a series of events that include the Serpentine Sweatshop events at the Serpentine Gallery and Reconsidering discussions at Tate Britain.